Being not very profitable for gamblers, American Roulette is still very popular among all of them thanks to its challenging nature: gamblers check their luck in beating this roulette variation. 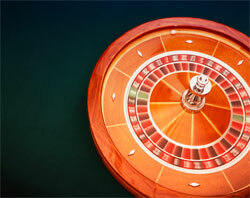 American Roulette is practically the same with European Roulette: the same object, the same rules and the same bets. The difference is the only one but it is very important for players as it determines a house edge - not very profitable actually. American Roulette is also called to be Double-Zero Roulette thanks to a roulette wheel which is used to play this game: it has one additional sector - 00that decreases the chances of a player for winning. In the past, American Roulette wheel had one more additional sector - American Eagle, but it is absent in modern roulette wheels. So, the modern wheel has 38 sectors: 1-36 colorful (red and black) sectors, and 2 green ones - 0 and 00. Because of the 00-sector presence, the house edge of American Roulette is bigger than the one of European Roulette: 5,26% when European Roulette has only 2,67%. 1. Buy special roulette chips before the game. 2. 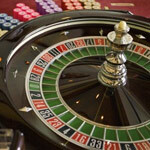 Choose your bet to make (inside or outside one; you are welcome to read more about all types of roulette bets here.). 3. 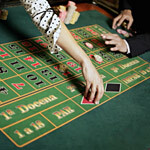 Make your bet before a croupier announces "No more bets!" or places "dolly" on the table layout. 4. A croupier spins a roulette wheel and draws a special small plastic ball which determines the winning bet: if you are lucky, this ball will stop at your number and you will win money! 5. Do not believe all roulette myths which tell you to use a special betting system for beating roulette: they do not work actually. 6. Do not forget to exchange roulette chips for regular casino chips because you will not be able to change them for real money. 7. Even if you did not win anything, do not forget to give tips to your dealer. Actually, American and European Roulettes were the one game till the 19th century when French colonists brought this game to the USA; New Orleans was the gambling capital of those times, so it was the first city which accepted a roulette game and developed it. Today it is possible to meet many different variants of American Roulette with their own rules and payouts but the same object.